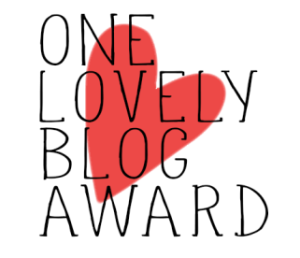 I’ve been nominated for the One Lovely Blog Award by the lovely Lucía @ Luucy Love Books. Thank you so much! Please go check out her wonderful blog. I don’t watch much TV. I have a few shows that I really enjoy watching (e.g. Elementary, Great British Bake Off, How to Get Away with Murder) but I just don’t enjoy most TV shows. I’ve had two jobs in retail and I hated them both. I don’t sleep very well. I haven’t since I was born. When I was in high school I only slept for a couple of hours a week. I performed as a dancer in pantomimes every Christmas from being 8 years old to 15 years old. Do they have pantomimes in other countries? I love video games. I’m currently working my way through Assassin’s Creed: Syndicate and enjoying it much more than I expected to. I’ve been to the USA three times. I’ll be going for a fourth time next October (2016). I’ve only ever been to Florida and New York though. I’m a huge Doctor Who fan. Or I was. I haven’t really enjoyed it since David Tennant left but I still watch it. If you have already done this or don’t want to do it then feel free to ignore this nomination! Thanks again to Lucía for nominating me! I love Bake Off and feel the same way as you about Dr Who! I wish Doctor Who was as good as it used to be! How did you managed with that little sleep? Yay, I’m glad to hear it! The concept just sounds so interesting, thanks! Elementary is so good! Are you looking forward to the next series? I haven’t completed season 3 yet so I need to do that before season 4 starts in the UK. Thanks for the tag!! We don’t have pantomimes, are they like plays? Like a Christmas Pageant? Also, omg How to Get Away With Murder is freaking CRAZY. Blows my mind. It’s like a musical comedy play that’s specifically for families and they’re normally shown from December until January/February. They’re usually different versions of fairy tales like Snow White, Cinderella, and Aladdin etc. There’s a lot of audience participation in them too which is nice for the children.